When all roads out of town are flooded, there's only one way to get out: by helicopter. With many homes underwater, some pretty amazing-looking choppers were brought in to rescue Guerneville residents and take them to shelter in Santa Rosa. 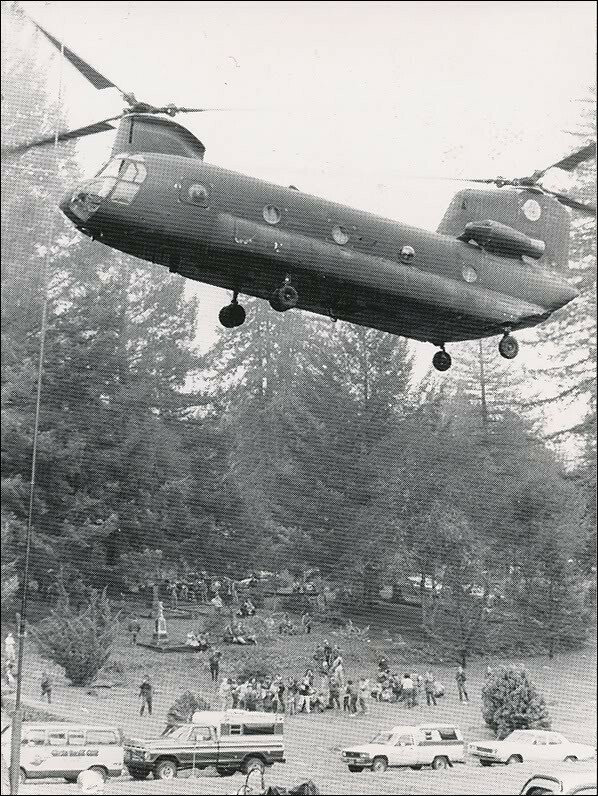 Here's a helicopter coming down at Redwood Memorial Gardens, the cemetery in Guerneville. A large group of kids awaits on the ground below, pointing and gawking at something they'd only seen in the movies.Surely there must be someone from this group that remembers a helicopter this size taking them to safety! If you're one of these kids; or if one of these cars belonged to you; of if you remember waiting at the cemetery to be rescued, feel free to tell us. What was it like? What do you remember?Let us know in the comments below.The Guerneville Flood Project is a week-long dive into the photo archives of the North Bay Bohemian. Read about the project here, and view more 1986 Guerneville Flood photos by clicking here.